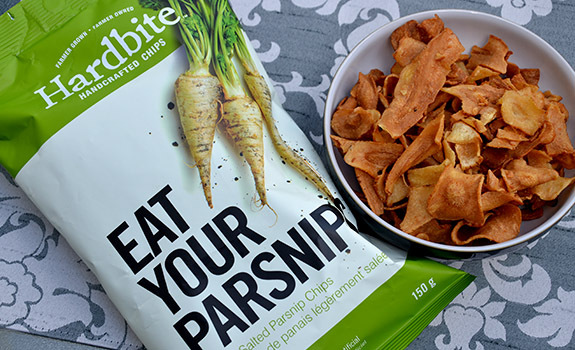 A pretty, earthy-looking bag of Hardbite Eat Your Parsnips chips. Would you pay twice as much for a vegetable chip made from a vegetable other than a potato? Looks like Canadian chip maker Hardbite is betting you will. The Look: It’s a pretty package with lots of earthy green and bold typography. A beautiful photo of dirt-speckled parsnips evokes the fresh-from-the-soil vision they’re aiming for. When you open the bag, it’s abundantly clear just how little is in the package you paid a premium for. The chips are oily and brownish in appearance, and in the bag I got, a whole lot of them had been reduced to tiny pieces. This is annoying, and it makes them less presentable when you’re entertaining guests. The Taste: Sweet and oily, with a definite carrot/parsnip flavour instead of potato. A little like a salted chip crossed with glazed carrots from a Thanksgiving dinner. Texture is crunchy, but also mooshy. 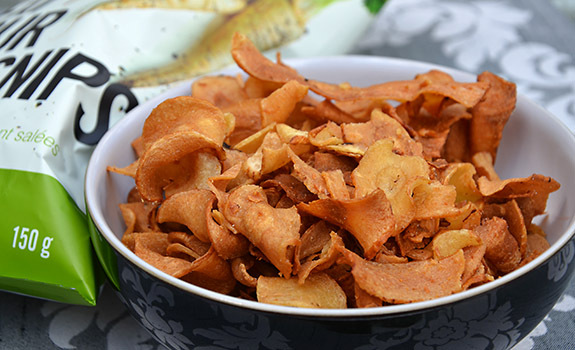 It feels very different than a potato chip in your mouth, in that the crunch isn’t as dramatic and it disintegrates quickly. They clearly absorb a lot of oil during cooking, as the oil is a very noticeable part of the taste. The more you eat, the more you pick up on a pronounced bitterness in the chips. A bowl of Hardbite Eat Your Parsnips chips. Too many chips in the bag were semi-crushed, possibly because they’re more delicate than regular potato chips. Cost: $5.29 for a 150 gram bag at Calgary Co-op. Value for cash money: Not good. The regular Hardbite chips were on a 2 for $5 sale directly next to the parsnip chips, nicely emphasizing how overpriced these are. Nutrition? : Per 20 chips (40 grams): 170 calories, 18 grams of fat, 150 mg of sodium, 1 gram of fibre, 0.2 grams of protein. Made by: Christina. Thanks, Christina! The verdict: They’re different from regular chips, and I don’t mind the flavour. It really is an odd hybrid, best enjoyed in moderation. The stumbling point for me is the price. For the same cost as a regular bag of chips, I could see picking these up on a rare occasion when I wanted something different on the snack table. But at over five bucks per bag, it’s just not worth it. I LOVED THEM! And at to think they are a healthyier snack… is a bonus! Mine were $3.99 at The Independant.